MP chief minister Shivraj Singh Chouhan’s investments in irrigation, electricity, roads and procurement systems worked for the state’s farmers. The new UP CM would do well to emulate him. Yogi Adityanath has been in the news ever since he took over as the chief minister of Uttar Pradesh. His actions — closing illegal abattoirs, setting up anti-Romeo squads, farm-loan waivers, government purchases of wheat and potatoes and notices to sugar mills for clearing farmer dues — have kept Adityanath in the limelight. Several of these steps highlight the UP CM’s concern for farmers, who have been getting a raw deal for years. Should he intend to be in for the long haul, Adityanath would be better off taking a leaf from what we call the “Shiv mantra”. The mantra derives its name from Shivraj Singh Chouhan, who is in his third term as CM of Madhya Pradesh. Chouhan was, like Adityanath, a five-time member of parliament before becoming CM in 2005. There are good chances of him extending his stint as the MP CM when the state goes to the polls in 2018. In this article, we describe the policies, which have made Chouhan a hit with the voters, as “Shiv mantra”. Chouhan concentrated on agriculture, which employs the largest share of MP’s workforce (54.6 percent in 2015-16 as per the Labour Bureau). MP’s agri-gross state domestic product (agri-GSDP) grew at 9.7 percent per annum — the highest ever achieved by any state — between 2005-06 and 2014-15. All-India agri-GDP growth during this period was 3.5 per cent and UP’s growth in this respect was even lower at 3.2 percent. 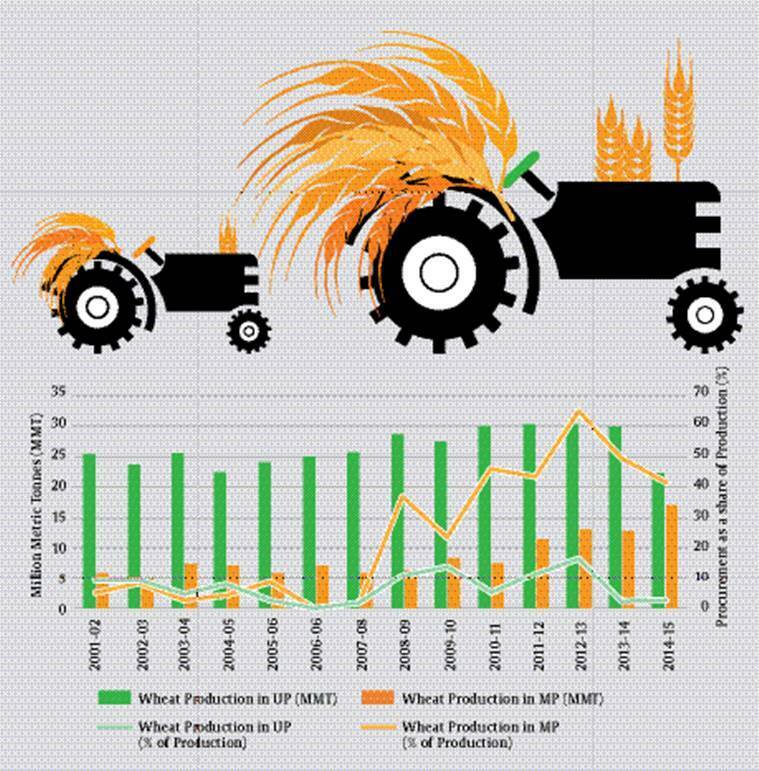 MP’s agri-performance, therefore, has been more than three times better than that of UP’s. Chouhan’s mantra is worth learning for Adityanath, more so when UP is more generously endowed than MP with nature’s gifts — fertile Gangetic soil and relatively abundant water supplies. Over the last decade, MP has made rapid strides in agricultural production. The state’s wheat production increased from 6 million metric tonnes (MMT) in 2005-06 to 17.1 MMT in 2014-15 — a 185 per cent leap — and soybean production increased from 4.5 MMT to 6.4 MMT over the same period. Horticultural production increased spectacularly, indicating agricultural diversification. Between 2009-10 and 2015-16, horticultural production increased from 6.4 MMT to 22.5 MMT — fruit production having increased from 2.9 MMT to 6.3 MMT and vegetables from 3.1 MMT to 14.8 MMT. Area under horticulture more than doubled from 6 lakh ha to 14.1 lakh ha. Such rapid strides in agricultural production earned MP the Krishi Karman award more than once. How did this come about? The Shiv mantra began with paani. Chouhan targeted an increase in the area under irrigation. MP completed several unfinished irrigation projects on priority. Between 2009 and 2014, over 1,400 minor irrigation projects were completed in MP, increasing the state’s irrigated area by 4.8 lakh ha. But efficient utilisation of groundwater irrigation required provision of uninterrupted power supply. Bijli (electricity) was, therefore, Chouhan’s next target. Uninterrupted power supply to fields was ensured during the wheat season. Agriculture’s share in total electricity sold rose to 36 per cent in MP in 2014-15 from 32 per cent in 2007-08 — as against 18 per cent in UP. The irrigated area in MP, thus, increased from 30 per cent of the cropped area in 2005-06 to 41.2 per cent of such area in 2014-15. The MP government also incentivised wheat production by giving a 10 per cent bonus above the Centre’s minimum support price (MSP) from 2007-08 to 2014-15. This encouraged extensive wheat cultivation. Wheat production in MP rose enormously — its share in all-India production shot from 8.6 per cent in 2005-06 to a whopping 20 per cent in 2014-15 making the state, the second largest wheat producer in the country after UP. It surpassed Punjab. The procurement system (sarkari khareed) was strengthened considerably. A digital app called e-Uparjan was developed to systematically manage procurement operations and payments. Farmers were sent SMS alerts about the procurement dates and procurement centres. Wheat procurement in MP sky-rocketed (see figure) increasing the state’s share in the all-India pool to over 25 per cent in 2014-15. Roads (sadak) were built to enable farmers to tap markets that were far and wide. Total road density in MP, between 2005-06 and 2014-15, increased from 535km/1,000 sq km to 937 km/1,000 sq. km. The proportion of surfaced roads increased dramatically from 50 per cent to 81 per cent. This bijli-paani-khareed-sadak formula did wonders for MP’s agriculture. Agriculture’s share in the GSDP increased from 28 per cent to 37 per cent. Rural poverty fell from 53.6 per cent in 2004-05 to 35.7 per cent in 2011-12. While some may view this growth with scepticism, the fact that sales of private sector tractor companies showed a four-fold increase in seven years (2007-14) is another cause for optimism. A high percentage (78.8 per cent in 2013-14) of land in UP is irrigated but erratic power supply, especially in Eastern UP, hampers efficient utilisation of groundwater. UP’s road density (1,724 km/1,000 sq km) and proportion of surfaced roads (86 per cent) is also higher than MP’s. But inadequate procurement systems have set the state back. The right incentives — beginning with wheat and paddy cultivation — including setting up a strong procurement system and ensuring timely payment of MSPs could result in UP farmers getting 10-25 per cent higher prices for their produce. Encouraging private investments in UP’s agro-processing can help promote agricultural diversification. Solar-powered cold storages for potatoes could prevent price-crashes and also save energy costs. If CM Yogi can go big in replicating this Shiv mantra in UP, he can look forward to following in Chouhan’s footsteps and winning two more terms in the state. Passion, focus and perseverance are the key.